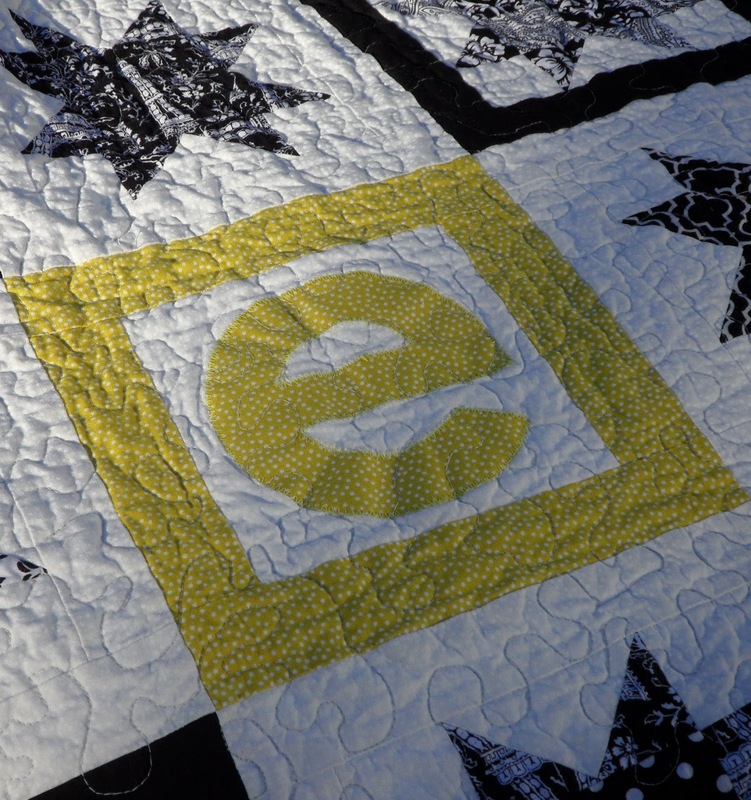 At the November meeting, I showed a baby quilt that I had made with a large "e" appliqued to the top. It was my first go around with applique, so I was generally pleased that I figured out how to get it on there without sewing it on backwards. But after I quilted it and washed it, I noticed that the stiffness from the fusible applique really gave the "e" a different texture than the rest of the quilt. The quilting looked very flat and didn't have that nice crinkled/puckered look. This was a bit of a disappointment for me because pulling a quilt out of the dryer to see how the quilting looks after the first wash is one of my favorite moments in finishing a quilt! Shortly after I finished my quilt top, I was asked to make the "connect the dots" block from the Block Party book for an online quilting bee. 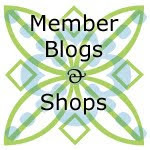 The bee member asked everyone to try "windowing" the applique and sent us all a helpful video from the Fons and Porter site to learn how. It worked like a charm, but was unfortunately too late for my very stiff "e"! I thought I'd share the tip in case there were any MMQG members who hadn't heard of it. 1) Trace your design/shape onto a piece of double-sided fusible interfacing. Draw on the smooth paper side, not the bumpy side. If your shape is directional, make sure you trace it in reverse as you will be fusing this onto the back/wrong side of your fabric. 2) Cut out the interfacing, leaving about 1/4" extra on the outside edge. Don't cut directly on the line that you just traced, you'll cut along the line later once you've fused your interfacing to the fabric. 3) Cut into the middle of your interfacing shape and around the inside about 1/4" from your traced line. Your interfacing will now look like a cookie cutter. This is really the only step that differentiates "windowing" from regular applique. 4) Place the sticky side of the interfacing onto the wrong side of your fabric and press according to the instructions from the interfacing manufacturer. 5) Now that your shape is fused to the fabric, you can cut along the line you traced on the paper side of the interfacing. Peel off the paper backing from the interfacing. 6) Place your applique'd shape on top of your quilt block/background fabric. Press in place and stitch around the edges as you normally would to secure it permanently to the fabric. Great tip - thanks Gina! Thanks for giving me an "aha moment"! What to do with those bee or lotto blocks?